August 30 to September 2, 2001. Where else than beautiful island of Naxos for a lovely but short 2nd honeymoon?! 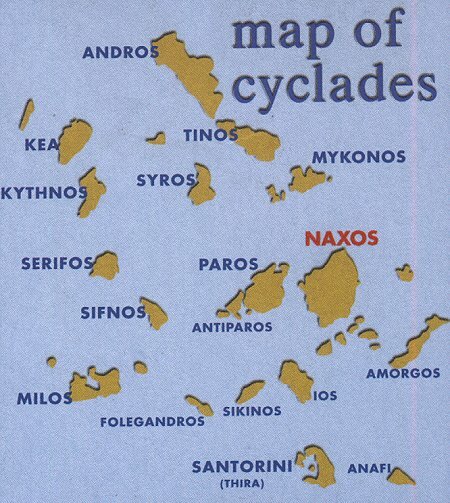 Regarding to where is Naxos, you can check the maps, below, as well as my earlier trip reports to this very island. The boat trip is very short nowadays, lasting only 3hrs 30 min, in a very fast and clean Highspeed ferry. The cost is similar to the other boats, too, at around DRS 10,000 per person and the same amount for the motorcycle. Oh, didn't I mention it? WE went to Naxos, aboard the R1100GS!. 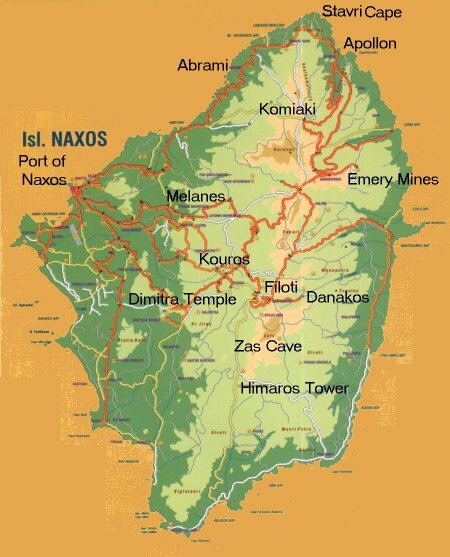 This is Naxos map, and the places we visited. This is where it is located, in the middle of the Aegean sea. Naxos island has some special importance for me, and for my wife, too! You see, my dad was born in the village of Komiaki, there, some 76 years ago, so this trip was something like retracing my roots. However, this is not the only single reason Naxos raises a smile and brings back a lovely memory. We -me and Ophelia- have revisited this island, a few years ago, once in 1985, and again in 1988. The first time is the most memorable. It is when and where I proposed wedding to Ophelia!!!!!!! !